Running in Moscow is taking off, but in many ways, this is a young man’s game. It was a Friday night at 8pm and although I was sitting in a restaurant with a menu in front of me, I was obsessively refreshing a website on my phone. Registration for the Moscow Half-Marathon had been scheduled to open at 7pm, but the “register now” button had yet to appear. It didn’t surprise me that there were technical issues or that I was willing to spend my Friday evening waiting for a race registration to go online. I have a slightly obsessive, type-A personality and had been known to stay up until midnight to get in to a triathlon that sold out in 10 minutes. What did surprise me was how many other people were spending a lovely spring Friday doing the same thing. Running has taken off in Moscow in the past couple of years. One of the first things I did when I moved back here in 2012 was run Nike’s “We Run Moscow” 10k, part of a series of races and race clubs Nike sponsors all over the world. It was the only race I ran in Russia that year and at the time it seemed like the only game in town. It was a crowded course, but there hadn’t been any need to obsessively watch the web to register, even though the race was free. What a difference 20 months makes. Now, I belong to a Facebook group where organized runs – mostly at the half-marathon and marathon distance – are posted, and there seems to be one every weekend. There are two race series that hold races throughout the summer. Nike sponsors several running clubs in different parts of the city and there are a bunch of locally grown clubs and even company teams. At a recent half-marathon, I saw a group of guys wearing t-shirts identifying them as employees of the Moscow stock exchange; at previous events, I’ve seen groups from PwC Moscow and the Moscow School of Management Skolkovo. I run early in the morning and although it’s still unusual to see anyone else running on the street, at least a couple of times a week I see other people running laps around the pond in the small park near my house. The major difference for me running races in Moscow as compared to the U.S. is the demographics of the participants. I’m not fast, but with an 8-minute-mile, I usually place in the top-third of finishers in my age group (women 30-35) in your average American road race. Here, it’s more like the bottom of the pack. Russians who run are serious about it. And they don’t bother with short distances. Who cares about 5 or 10Ks? This is a marathon and half-marathon crowd. Additionally, at any given start line, I’m a good deal more, well, feminine than most of the participants. According to Running USA, at the half-marathon distance, 60 percent of runners in U.S. races last year were women. For comparison, in one half-marathon last year in Moscow, 1,083 men took part in the event and only 252 women. Another small fact: 850 of those men were under 40. In the U.S., 62 percent of men (and 53 percent of women) who participated in half-marathons last year were over 35. But this is a place to start. I don’t mind being in the bottom half of the pack if there are more races. 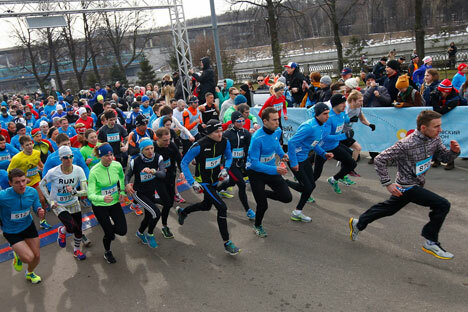 And, in a recent 5K in the Moscow Marathon Series, the percentage of women was higher – 419 women ran alongside 708 men. Registration for the Moscow Half-Marathon finally opened a little after 8pm. By midnight it was sold out. By the next morning, there was a waiting list hundreds of people long. The list of participants isn’t publicly available, but judging from the names of the people in the comment section, the male/female ratio in the corrals should be more balanced. In reality, though, that depends on which group was more willing to spend Friday night hitting the refresh button on their phones.